Britain's Liam Heath and Jon Schofield recovered from a "disastrous" start to win gold at the European Championships in Belgrade. The reigning champions stormed clear in the K2 200m final, winning in a time of 32.487 seconds. 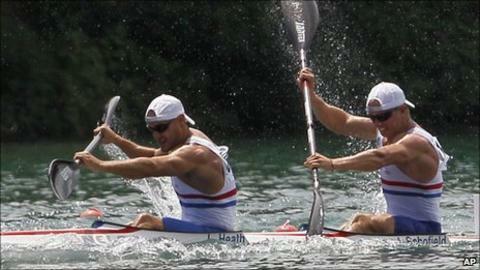 In the K1 200m, British world champion Ed McKeever lost his European crown as he had to settle for bronze. Britain's Lani Belcher also lost her K1 5000m European title as she was pipped to gold by Belarusian Maryan Paltaran. Belcher was also in action in the K2 500m along with Angela Hannah. The pair finished ninth. Heath and Schofield made things difficult for themselves when a shaky start to their first heat on Saturday meant they could only recover enough to move into second place ahead of Sunday's final. But the pair managed to pull it together to take gold ahead of Belarus. "I'm feeling really good right now," Heath said. "We walked away yesterday pretty confident despite our disastrous start, and went out there today and nailed it, which followed through to a strong second half. "Our preparations up to the race have been flawless; we just stayed focused and relaxed and delivered what we have practised a million times." McKeever was left disappointed with his showing, but the world champion said the loss will provide the ideal motivation as he steps up his training for the World Championships in August. "There is no shame in losing to people of that calibre," the 27-year-old said. "I've got eight weeks to the worlds and am looking forward to getting a solid block of training in, and there is no better motivation than being beaten." Also in action were Abigail Edmonds, Jessica Walker, Hayleigh Mason and Louisa Sawers - the quartet finished sixth in the K4. Walker was back in action for the K1 200m final, managing an eighth-place finish. Rachel Cawthorn recovered from a poor start to take ninth place in the K1 500m. Head coach of the GB canoeing squad Brendan Purcell lauded the efforts of the British squad. "Unbelievable racing from the K2," he commented. "They dominated from the start leaving the field in chase. "Ed underlined his champion qualities following his poor start to stay in the race and win the bronze. "The women's racing was tough today and it shows the high level of competition out there. Mistakes were made and we know there is some work to be done, but with all the boats qualifying straight into the finals we know we have the quality."